Nestlé has reported 3.5% organic growth in sales to SFr43.2 billion (€39.9 billion) for the first half. A foreign exchange impact of -2.0% coupled with the net result of acquisitions and divestitures resulted in reported sales falling by 0.8%. Organic sales growth was composed of 2.8% real internal growth and 0.7% pricing. However, pricing has reached a historically low level owing to deflationary environments across a number of developed markets and low commodity prices. Organic growth was broad-based across geographies and categories – 4.7% in the Americas (AMS), 2.5% in Europe, Middle East and North Africa (EMENA) and 2.3% in Asia, Oceania and sub-Saharan Africa (AOA). Nestlé’s trading operating profit was SFr6.6 billion, with a margin of 15.3%, up 30 basis points on both a reported basis and in constant currencies. This was driven by a gross margin expansion of 130 basis points. Nestlé delivered this margin improvement whilst continuing to significantly increase investment in brand support, digital, research and development, and in its new nutrition and health platforms. Consumer facing marketing spend increased by 8.5% in constant currencies. Nestlé is rolling out several key initiatives that are focused on structural efficiencies. One-off costs in 2016 will be off-set by savings. Group operating cash flow was strong at SFr4.9 billion and free cash flow increased year on year by 41% to SFr3.3 billion. These improvements were primarily the result of Nestlé’s focus on margins, discipline in capital expenditure and working capital. 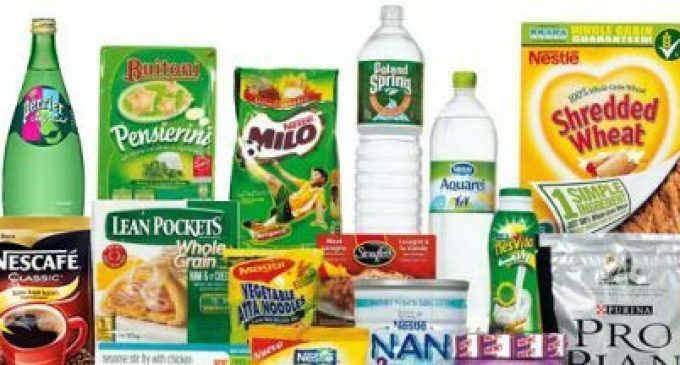 Nestlé has confirmed its full-year outlook for organic growth in line with 2015, with improvements in margins and underlying earnings per share in constant currencies, and capital efficiency.